Suitable for industrial printing of membrane switches, adhesive stickers, nameplates, dashboard, etc. Non-occupy space, screen vertical up down, ink doesn’t flow bias at lateral side. Excellent closed type absorbing device to eliminate rapidly shock vibration efficiency. Uses digitalized touch-screen control panel to preset parameters and quickly match printing requirements. TABLE SIZE (D x W / mm) 250x400mm 9⅞"x15¾" 400x600mm 15¾"x23⅝"
MAX. 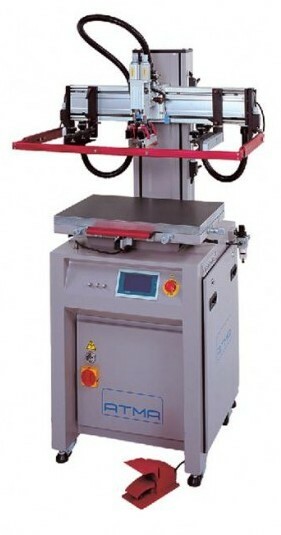 PRINT AREA (D x W / mm) 200x250mm 7⅞"x9⅞" 300x450mm 11¾"x17¾"
MAX. FRAME SIZE (O/D, D x W / mm) 520x380mm 20½"x15" 500x700mm 19¾"x27½"
SUBSTRATE THICKNESS (mm) 0-100mm 0-4" 0-100mm 0-4"
MACHINE DIMENSION (W x D x H / cm) 79x70x160cm 31⅛"x27½"x63" 85x71x152cm 33½"x28"x59⅞"